6. 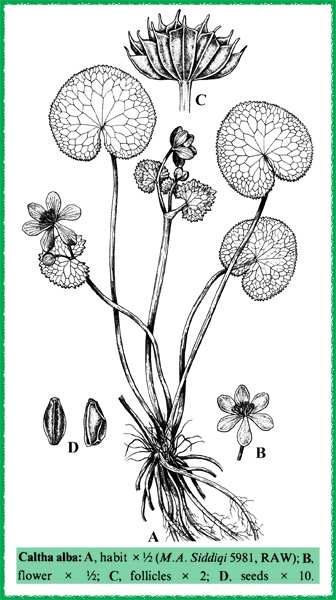 Caltha L., Sp. Pl. 558. 1753. Gen. Pled. 5:623. 1754; Boiss., Fl.Or. 1:59.1867; Hook.f. & Thoms., Fl.lndica, 39.1855; in Hook.f., Fl. Brit. Ind. 1:21.1872; Huth in Abb. Vorli Ges. Natur. (Berlin) 4:1-23.1891, reprinted in Helios 9:55-78, 1892; l.c. 9:99-103. 1893; Kordell & Koatim-Samon in New Phytol. 70:173-186.1971; Smith in Blumea 21:119-150. 1923; Qureshi & Chaudhri, Pak. Syst. 4(1-2):27.1988. Perennial plants with undivided leaves. Flowers simple or more often in a reduced inflorescence. Perigonium simple, composed of 5-10 petaloid sepals. Petals (nectaries) lacking. Stamens and carpels numerous, arranged in irregular numbers on a flat receptacle. Carpels free from each other, many seeded. Mature fruits developed as follicles. Seeds compressed obovoid or oblong, sometimes asymmetrical. A widespread genus of about 40 species distributed throughout both hemispheres. No species of Caltha are of any economic u se. Caltha palustris L. is said to be poisonous. It is widespread in temperate arctic Europe, Asia & N. America but is not represented in Pakistan. Caltha palustris var. alba (Camb. ex Jacquem.) Hook.f. & Thoms. = Caltha alba Camb.